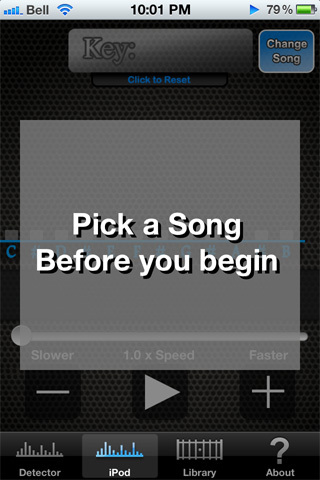 tomChord gets the chords from any song in your music library or from the microphone in real time. Stop searching guitar tabs sites and get tomChord now! Load songs directly from iPod library. The Key of the song. 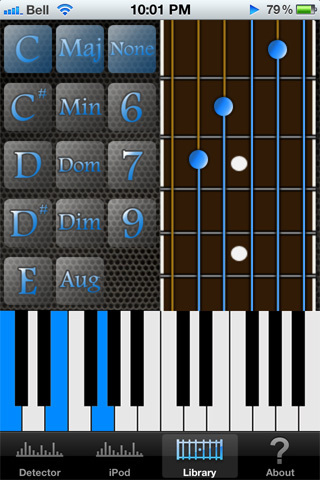 This program gets the right chords everytime..It's the app I've been waiting for for a long time!! Absolutely brilliant and really handy when you can't get to the Internet to find chords. It nailed every chord I was playing in milliseconds, and seems to do a pretty good job picking up the chords from tunes on the iPad. I am overall impressed. It's a great tool for budding/inexperienced musicians and weekend warriors alike. tomChord uses advanced harmonic algorithms to extract musical information from audio data. What inputs does it support? 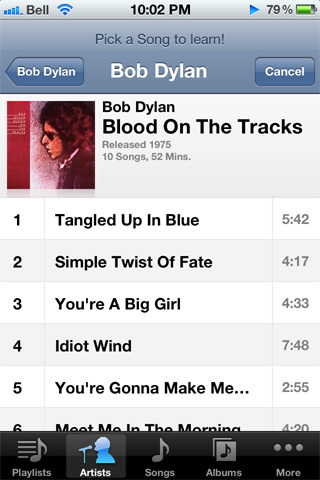 tomChord supports both microphone input and songs from your iPod library. 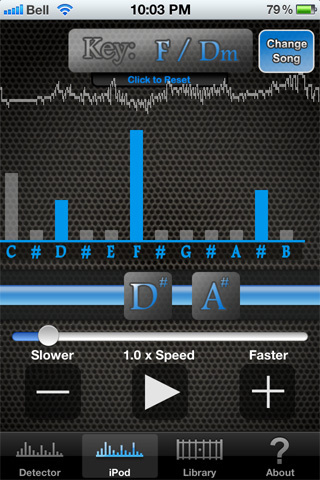 Checkout Guitar Tuner - Chromatic. It's free! A new algorithm allows tomChord to run in real time with a 4x faster refresh rate. A volume control allows filtering of background noise and increased accuracy! An improved user interface with new intuitive controls and results as well as HD iPhone 4 retina graphics. Comments? Questions? Feedback? Bug Reports? Copyright © 2010 Tom Hoddes. All Rights Reserved.